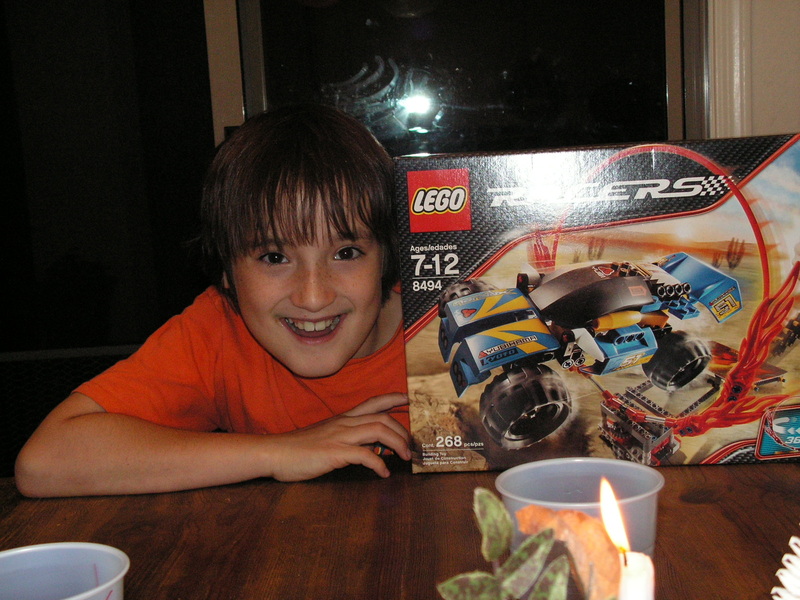 Today, my baby boy turned 13, and despite all the warnings…. I wasn’t quite ready. He’s my baby boy for goodness sake. He is our only child, out of four, who was born in the USA. (We have two Canadians and one Colombian.) I felt the need to display the American flag picture for all to see. He was so darling…. and the sole child with an American photo shoot. Yes, the birthday boy has his eyes crossed. Typical. Why am I surprised??? I don’t know. He does bring lots of laughter and joy to our home, for which I’m thankful. Keeve was our easy child. From birth, every time anyone looked at him he couldn’t help but smile. See? Darling. 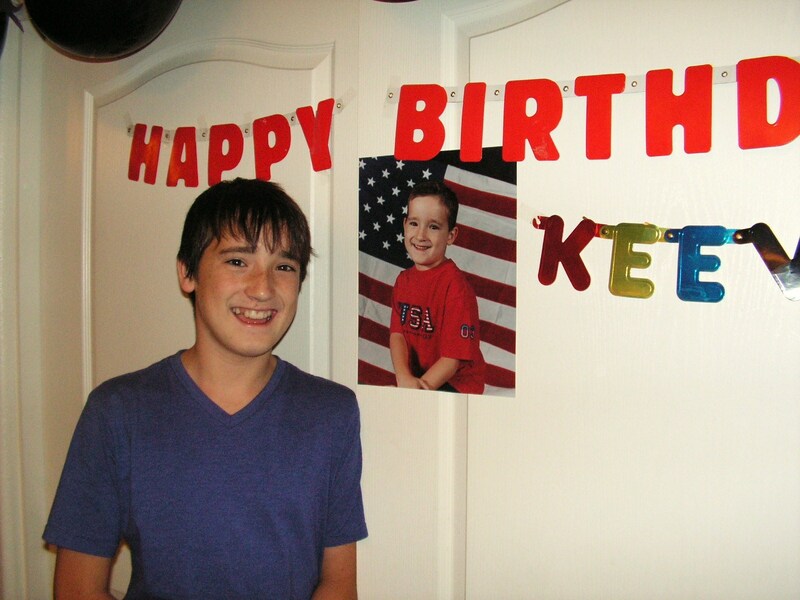 I tried to liven up the party and did a little jig for Keeve…. he picked up one of the birthday cards he had just opened and held it up to me. It said, “WOW!”… then he turned it over so it said, “MOM” Hahahahaha. Then I stopped dancing. If every kid was as mild-mannered and sweet as Keeve, this world would be a better place… albeit moving at a MUCH slower pace. That’s my boy signing his name on the wall at the Shelby plant in Vegas…. circled blue ink… “Keeve #5 Crosby” with a thumbs-up drawing! Rick and I went out to lunch today (to Chipotle, if ya had to know.) While we were there Keeve called us four or five times. 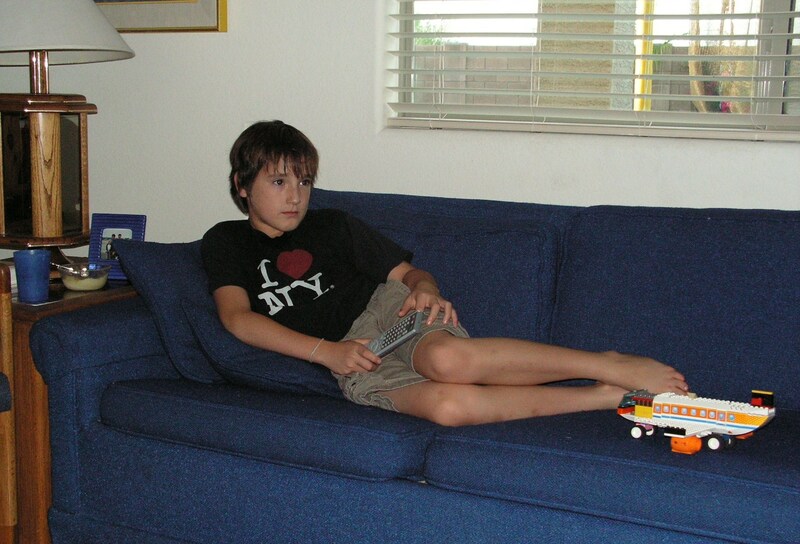 He was supposed to be doing his math, piano and chores. He was a bit distracted by the thought of us being across the street from Walmart…. where so many of his immediate needs could be so easily met. We bought him blank DVDs last night, but alas, we got the wrong ones. So he needed the CD-R kind. Fine. That was Call #1. Call #2 was because we are fresh out of fresh strawberries… which Keeve uses every single day of his life to make fruit smoothies. (See this post for more smoothie news: https://mysistersjar.wordpress.com/2009/05/15/bonus-points-for-kid-3/ (Jennie, you need to teach me how to do the CLICK HERE links.) So strawberries were added to the list. Call #4…. “Daaaaaad, when we were in Walmart in Las Vegas, Mom said I could get a plastic blue pumpkin head to keep my candy in. Can you please get me a plastic blue pumpkin head? They are only $1.” I verified the story and the plastic blue pumpkin head was added to the list, which by this point had actually become a written list. Call #5 was received in Walmart, just to make sure we hadn’t forgotten anything on Keeve’s all important, I’ll-just-die-if-you-forget-something list. Sadly, Walmart was out of plastic blue pumpkin heads… but not strawberries or CDs. WHEW! What in the world did we do before cell phones? A very Happy Birthday to my boy Keeve. He is the youngest in our family until Zaza gets here. As most parents with multiple children know, EVERY kid is so different from his siblings. No exception here… at all. Keeve has various aliases used on the computer and on his grammar sheets. Hey, when you’re homeschooled, your mom knows your hand writing, so you can make up a new name every day. :o) He is called DigDog, Q, and Fever on the computer. Here is the name list from his school sheets: Fire, Kiss the Cook, Bob, Fred, Space Man, W, Crosby #5, Sleepy, Slow Poke, Ferrari, Cool Dude, Mario and today was Birthday Boy! It makes me smile every time I read a new name. Keeve is our relaxed child. Take’er easy. Chillax. Go with the flow. But lately a new, livelier personality has emerged. He’s not taking a beating from his older brother any longer. One or two purposefully planned retaliations, and he’s holding his own now. Keeve has soaked in the prophecy from the pediatrician that he will be 3 maybe 4 inches taller than his older brother. He asks frequently, “How much more than Austin do you think I will weigh when I’m taller than him?” What do you say to that? WAY more, honey, WAY more. He has also started answering my questions, which is not good. I don’t ask questions to be answered. I ask questions to make the kids feel like they have a choice in doing what I say… but they really don’t. He’s the only one who caught on to this. “Would you like to empty the dishwasher now, or after you eat?” I ask. “I don’t like to empty the dishwasher,” comes a sweet voice with a naughty smile on his freckled face. I’ve had to rephrase things for him…. “It’s now you’re turn to empty the dishwasher. NOW means NOW,” said in a sweet voice to my boy with a knowing smile on my face. Keeve is our most compassionate child. He prays for those who don’t have homes to get one, and for those who are sick to be healed. It’s truly heart warming. He gathers up hockey cards and sticks of gum and mails them to his friends and cousins. He always licks the envelopes before I see what is inside, but I know he writes letters and includes them too. So, Happy Birthday to my boy! 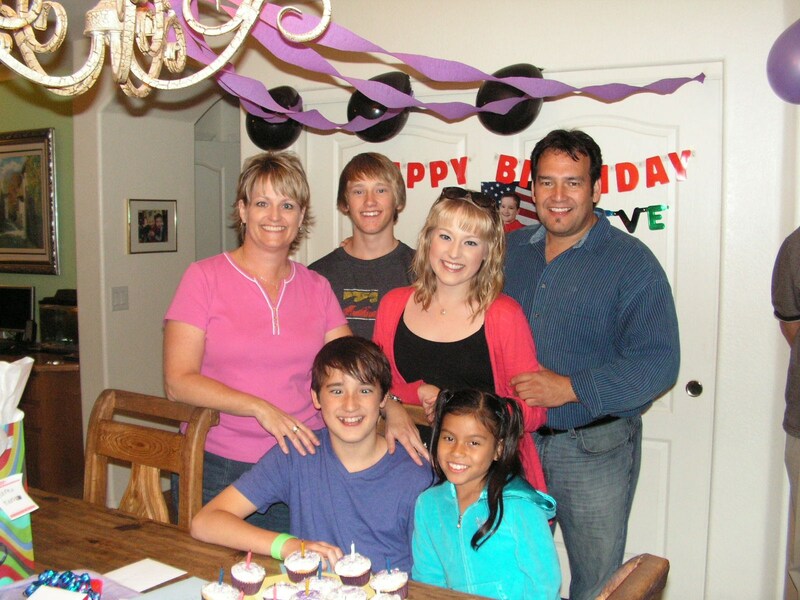 What a strong and brave son you are… and double digits too! What do Homeschooling Mothers Do ALL Day? They shred old dust-ruffles so their children can mummify Barbie. What do you think we do all day??? 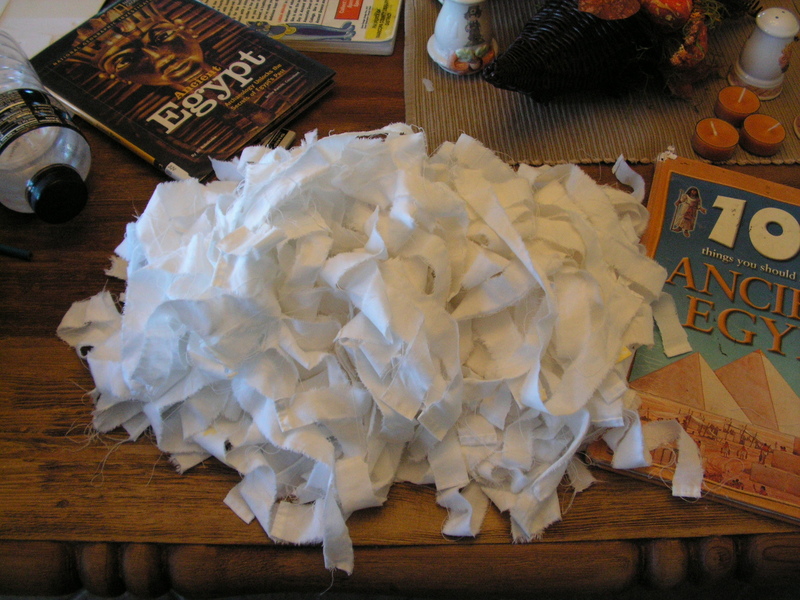 I have a few words of advice for future dust-ruffle shredding moms: #1. Don’t wear black. It looked like I dusted a haunted house with my front side when I was done. #2. Wear a face mask. Seriously. I just finished reading a novel about girls who were getting sick working in the cotton mills…. NOW I understand. I’ve blown my nose 27 times since the shredding. #3. You only need the frill of a single size dust ruffle to mummify at least 8 Barbies. 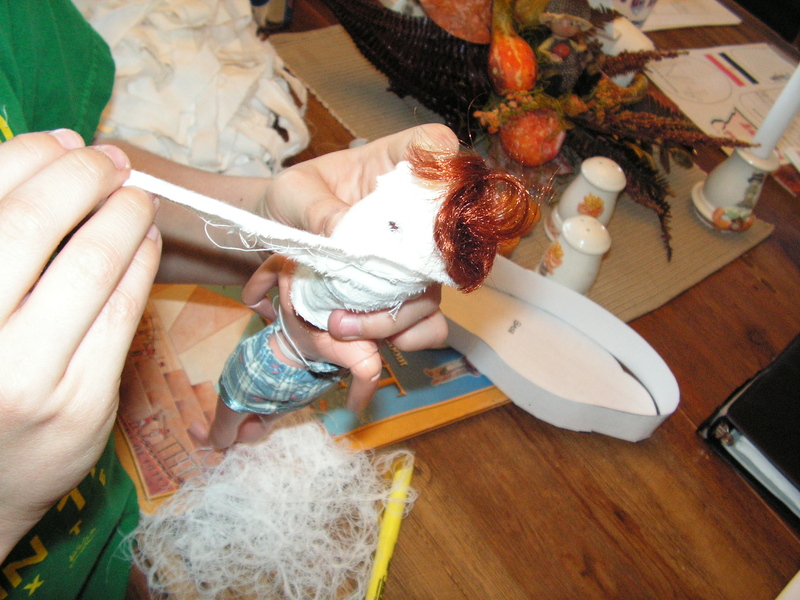 I did a queen size ruffle and we did 6 Barbies…. I have enough left over to do 12 more. See? This is such helpful information for future moms of mummifiers. Here is a photo of Keeve practicing the mummification process. He figured out that Barbie wouldn’t fit in her sarcophagus without a haircut first. That was yesterday. Today six homeschooled children were given permission to cut off Barbie’s hair. You should’ve seen the smiles! Then they dipped the strips of cloth in papier mache so everything would dry in place. What a mess, but it was fun. We’re not sure when it started. We’re not sure why it started. We’re not even sure what it means. For years our son has been signing his name Keeve-Q. Q… why? We don’t know. His middle name starts with a K. It has been his signature mark … even when his name doesn’t show up, the Q is there. I asked him why he writes Q… he said, “Because it’s cool.” I’m sincerely hoping he doesn’t think that Q is the first letter of the word Qool. 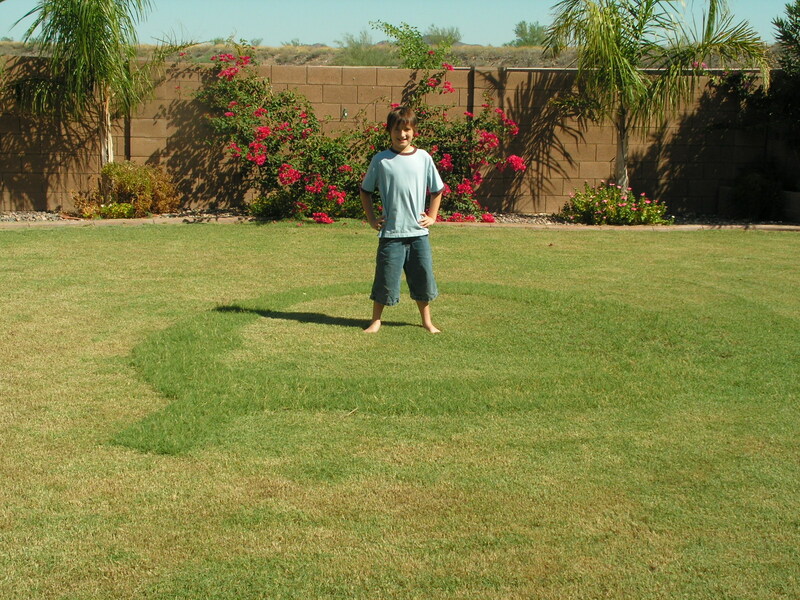 So why was I surprised when I saw the gigantic Q in the lawn after Keeve mowed? I don’t know. Maybe the size of it? Maybe the amount of time it would have taken him to move the mower in and out of the Q? I don’t know. There it was staring Q-ly at me … and even in the right direction to read it from the kitchen window. He’s so thoughtful. We’re trying to channel his creativity into music at present. His piano lessons started last week and he has mastered Beethoven’s “Ode to Joy.” (The one-hand, one-note-at-a-time version.) He is truly a gifted child. (Typed with tongue in cheeQ.) Q. This is what I love about motherhood. You never know when you’ll find Q surprises waiting for you to see the spunkability hidden inside your kids. Yesterday, I was cooking dinner and behind me at the kitchen table was Keeve, our youngest son. He had the gallon of milk out that was down to about 1 1/2 inches left. Instead of pouring it into a cup to make chocolate milk, he was squirting the Quick straight into the gallon container. He then replaced the lid and gave it a good shake. Sadly resulting in tan colored milk. So he squeezed and squeezed the chocolate syrup until it was dry. (I hid the bottle in the garbage, so Rick wouldn’t add water to it and put it back in the fridge.) Shaken again…. not the desired color. So ingeniously, Keeve went back to the fridge and found the Nestle strawberry syrup and proceeded to add it to the beige milk. Unfortunately, it was also almost empty. 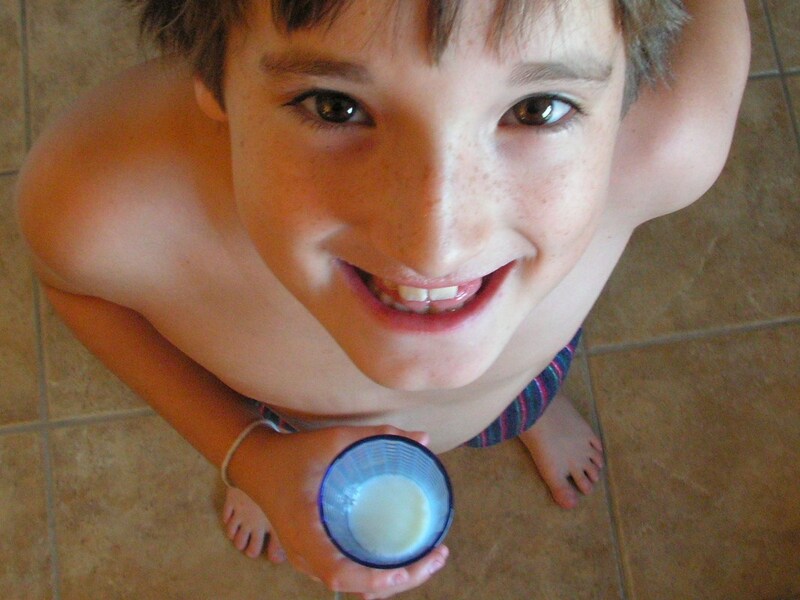 But the remains were mixed with great vigor and a slightly-sunburned-flesh color of milk was the result. At that point Keeve poured it into a cup and drank the whole thing down in one bottoms-up. 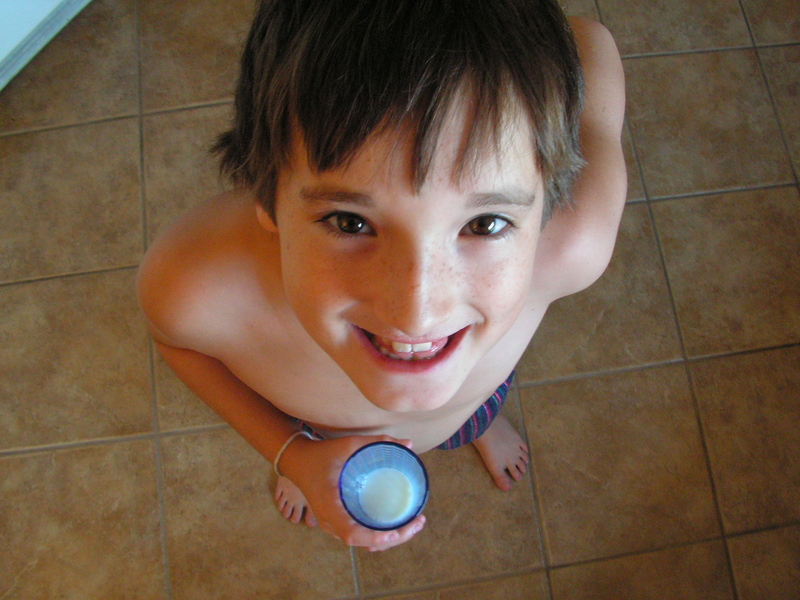 I inquired about the taste… he said it just tasted like normal milk. 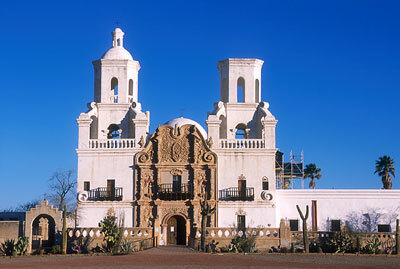 During our study, we traveled to the oldest mission in the West, San Xavier del Bac down near Tucson, AZ. It is a gleaming white building with twin bell towers (one remains unfinished) that sticks out like a giant marshmallow trying to hide in the flat brown desert. My children had never crossed the threshold of a Catholic church and we wanted them to see the pride and beauty of the historic 200+ year old building. The original solid, carved mesquite-wood doors are still holding in the interior coolness…. even in the summer. Breathtaking. That’s the only word that comes to mind to describe the paintings, not only framed and hanging, but on all the walls and the ceiling. Frescoes, statues, mock-rope trim, all reminiscent of another place (Spain) and time (1800s). End of history lesson. The three kids were admiring all the candles and the hundreds statues of saints, monks and holy men adorning the altar. We were among many silent visitors and solemn parishioners at the front of the church, when my seven-year-old son, Keeve, yelled excitedly while pointing to a specific statue of a monk, “Hey, Mom! There’s Martin Luther!” No one laughed except me, and it was one of those burst out blasts-of-a-laugh that you can’t control, and is really loud especially in a quiet, echo-y place. When I recovered, I whispered, “No, honey. There’s no staute of Martin Luther in THIS church.” We left rather quickly and discreetly. Hey, I wouldn’t have even known why it was humorous two months previously. I just LOVE innocent, politically incorrect errors!